Everyone loves a ‘find,’ especially when it comes to furniture and home furnishings, which tend to be among the bigger ticket items in our lives. One of the greatest benefits of living in this city is that the city offers more NYC used furniture than most other cities combined. That’s what makes AptDeco such a find. It’s a peer-to-peer marketplace for buying and selling gently used furniture and furnishings. They also manage the entire process, making it easy to post and shop, then arranging pickups and deliveries, and payments, all across a verified community of buyers and sellers. They cover all the boroughs and the Tri-State area, and can deliver to Boston, Philadelphia and Washington DC as well. Cofounder Reham Fagiri tells us more about this service that’s giving furnishings a new lease on life. AptDeco is the easiest way to buy and sell used furniture! We provide a trusted marketplace where sellers can list their items for free, and buyers can easily find gently used modern and vintage furniture at up to 80% off retail price. AptDeco serves as the middle(wo)man by handling all of the operations on behalf of buyers and sellers, including pick up and delivery, payments, customer service, and much more. How is it AptDeco different? The only widely used solutions available are too sketchy and cumbersome, so much so that people end up throwing away valuable pieces of furniture. AptDeco provides a safe and reliable way for people to create value for their gently used furniture. There are no startups that provide the breadth of assistance we do for both buyers and sellers. Our community enjoys shopping from across the city without the need to schlep across town to view or carry a heavy piece of furniture. At AptDeco, we work with local delivery teams to pick up furniture that sells through the platform and deliver to the buyer’s room of choice for only $74 anywhere in Manhattan, Brooklyn, Bronx, or Queens—as well as the Tri-State area, Philadelphia, Boston, and Washington D.C.! 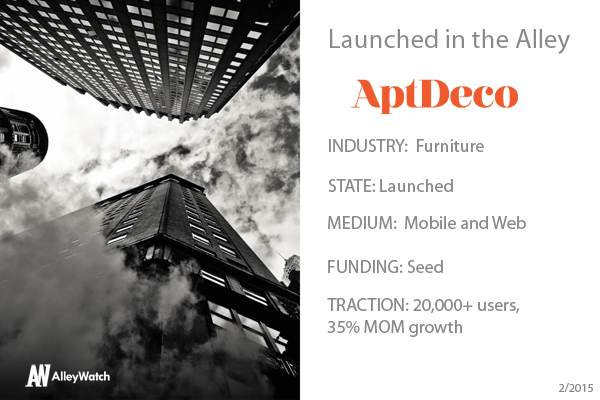 What market does AptDeco target and how big is it? Everyone needs furniture! In the US, the total addressable market for home furniture is over $170B, and we target sellers and buyers at a variety of price points. Our immediate target in the used furniture market is estimated at over $8B in the US alone. 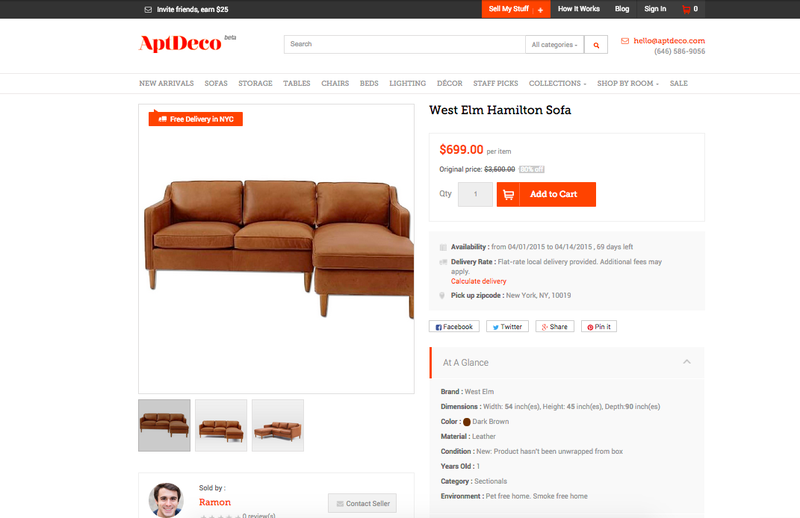 Sellers can list their furniture for free on AptDeco—it takes a couple minutes. When an item sells, our fee is 14%-19%, depending on the sale price. Buyers can purchase online as they would from any e-commerce site, and we pick up and deliver from seller to buyer, for a fee from $20 to $74. Verification and quality guarantee is built into our model. When I was finishing up grad school in Philadelphia, I had a pretty tough time selling my furniture in preparation to my move back to NYC. From the random strangers coming into my apartment to the extreme hagglers, the process was too cumbersome, to say the least. As a single woman living alone, I often felt unsafe when these prospective buyers were coming to my apartment so I was compelled to do something to solve this, once and for all. Tell us about your experience in Y Combinator? YC was instrumental to the growth of AptDeco. Coming from a corporate background, I learned invaluable lessons about building a business from scratch. YC emphasizes the importance of building your business, one customer at a time. Listen to them and improve your product, based on their feedback. We took this advice to heart and used it as the catalyst for enhancements. From your data, what’s the most sought-after piece of furniture in NYC? People can’t get enough of the West Elm Henry Sofa – it’s the most sought-after piece of furniture around. We can never have enough of them. Also, anything that’s tufted goes in a heartbeat. We’re proud of the impact we’re having here in NYC. We’ve just launched long-distance delivery from sellers here to neighboring cities like Boston, Philadelphia, and Washington D.C. Soon after, we will be expanding our presence around the Northeast. Our goal is to continue to build a trusted and real community of buyers and sellers – what AirBnB did for vacation rentals, we’re doing for used furniture. We’ve been fortunate enough to get introduced to many of the investors that are on our list. However, as a female founder, I have great admiration for all the hard work and success Caterina Fake has had while building successful companies. 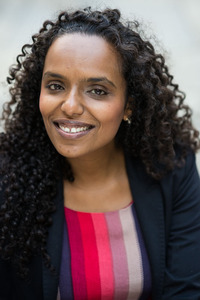 She is an inspiration to all women in New York City and the tech sector. What’s your favorite NYC happy hour spot in NYC? As an entrepreneur, I end up spending most happy hours in the office! I watched the World Cup and the Super Bowl from Bier International in Harlem, which is one of my favorite neighborhood spots.